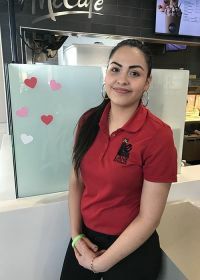 Irene Aguilar :: Lane Enterprises, Inc.
At Lane Enterprises, the McDonald’s on K42 is the testing ground for most new General Managers. It’s a busy store, with a loyal customer base that regularly order more food than other locations. It’s the restaurant that tested the skills of Irene Aguilar. Irene worked and received her Associates degree from Butler County Community College, after which she became a General Manager at K42. A year later she moved to South Seneca. Irene served as a General Manager at South Seneca for two years and did an amazing job, leading to her promotion to Supervisor in December. To Irene, having four stores under her management and working alongside Alexis was a natural step. Those different situations allow Irene to continue to grow into her new role, and she couldn’t be more excited.